We hope everyone can make it out and if you have a boat bring it out! If you dont come anyway we always need people to crew with us! Make sure and mark your calenders and dont miss this one!!! 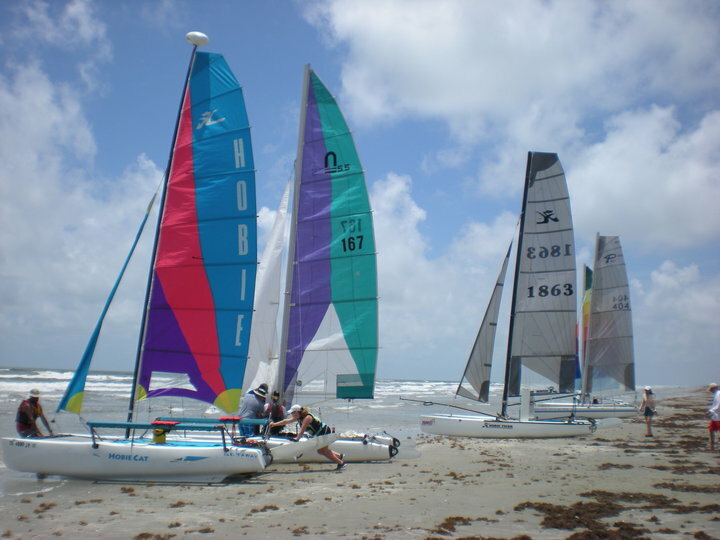 We are having a launch party April 16, 2011 to celebrate the new Hobie Fleet 33 in Surfside, Texas. Come out and join us for some social sailing in the gulf our goal is to introduce the sport of cat sailing to people. You should come out even if you do not own a boat and crew on one of ours. We will have BBQ pits and supply some burgers, hotdogs & snacks. Subscribe today to our website for additional info and sailing tips and updates on local sailing events. Take 288 south out of Houston. Stay on 288 and pass Pearland, Angleton, and Lake Jackson. When you enter the town of Clute (5-6 motels on left) you are almost ready to take 332 to Surfside. Take 332 Surfside exit and keep going until you come over the bridge into Surfside. You will see the welcome to Surfside picture above in front of you. Take a left at the bridge and go exactly 10 Miles and take a right at beach access 6. Take 45 South into galvaeston and go right when you hit the ocean/Seawall. Your now heading west to the west end of the island. When you get to the bridge pay the $2 fee and cross into Surfside. We will be a couple miles down on the left at the two story condos Beach access 6. ~ by Floyd on March 25, 2011.